As a result of the tsunami, sugar production was drastically reduced in 1946, 10,595 tons instead of the projected 26,000 tons. 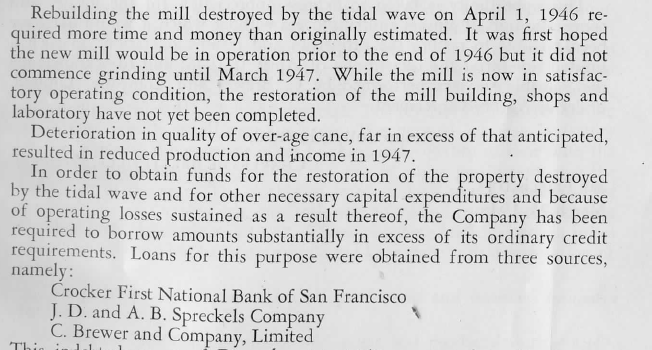 The mill reconstruction was not finished until March 1947 and full efficiency not reached until May 1947. The April 1, 1946 tsunami (not tidal wave) wreaked havoc on the Big Island. "The 1946 tsunami was generated by a magnitude-8.6 earthquake in the Aleutian Islands. It took five hours for the waves to reach the Hawaiian Islands. Unfortunately, there was no warning system at that time. There was devastation to homes, schools and businesses in Hilo and elsewhere, to the piers at the Port of Hilo, and to the railroad track and train cars." (Source: Barbara Muffler, Hawaii Tribune Herald, 4/1/2017). 126 Big Island residents died. Sugar production was drastically reduced in 1946, 10,595 tons instead of the projected 26,000 tons. ​The mill was destroyed and needed to be replaced.The mill reconstruction was not finished until March 1947 and full efficiency not reached until May 1947. The railroad system was destroyed, to be replaced by heavy trucks. The Port of Hilo, the point from which sugar was shipped to the Mainland for processing, was severely damaged. Cane could not be shipped until late June 1946. 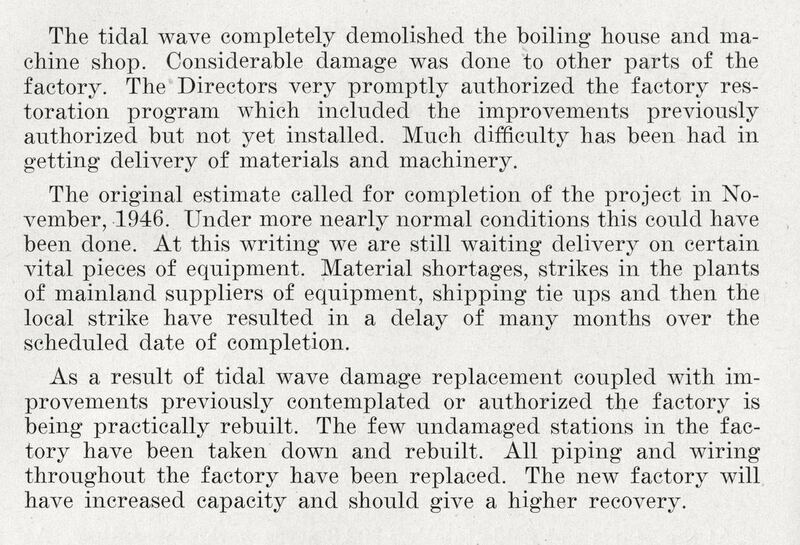 Excerpt from C. Brewer's 1946 Annual Report, ​courtesy of John Cross, Custodian of the Records, the Olson Trust Sugar Plantation Archives. Excerpt from the Hakalau Plantation's 1946 Annual Report, ​courtesy of John Cross, Custodian of the Records, the Olson Trust Sugar Plantation Archives. Photo taken by head bookkeeper Ralph Murray shows people watching the devastation at the top of the cliff near the warehouse. The trolley tracks are clearly visible, along with the chute from the top down to the mill and the flume along the cliff on the left side of the picture. Photo courtesy of Darrellyn Bates, granddaughter of Ralph Murray. A slide show of the devastation is below. 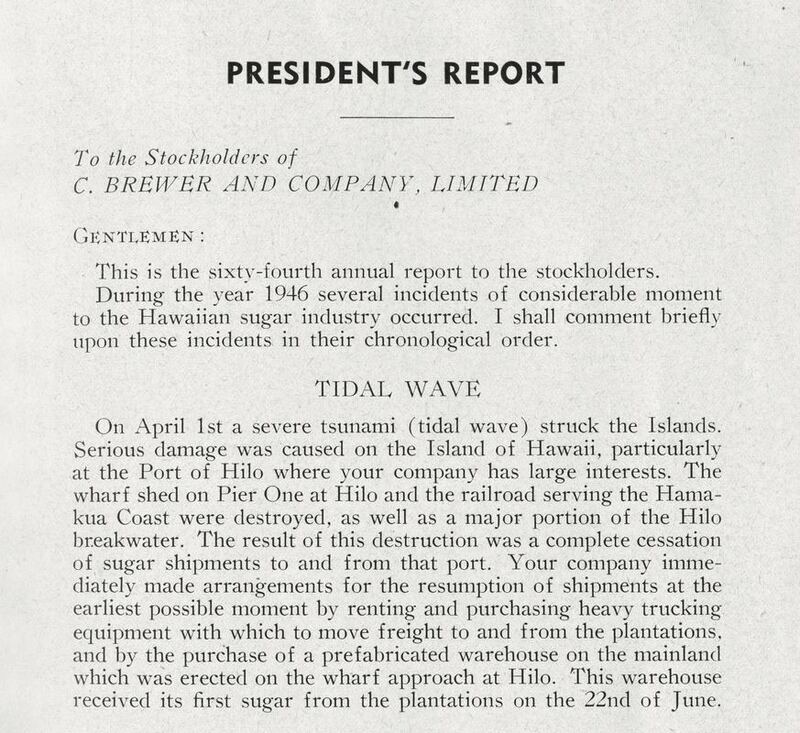 Excerpt from Hakalau Plantation's 1951 Annual Report, ​courtesy of John Cross, Custodian of the Records, the Olson Trust Sugar Plantation Archives. 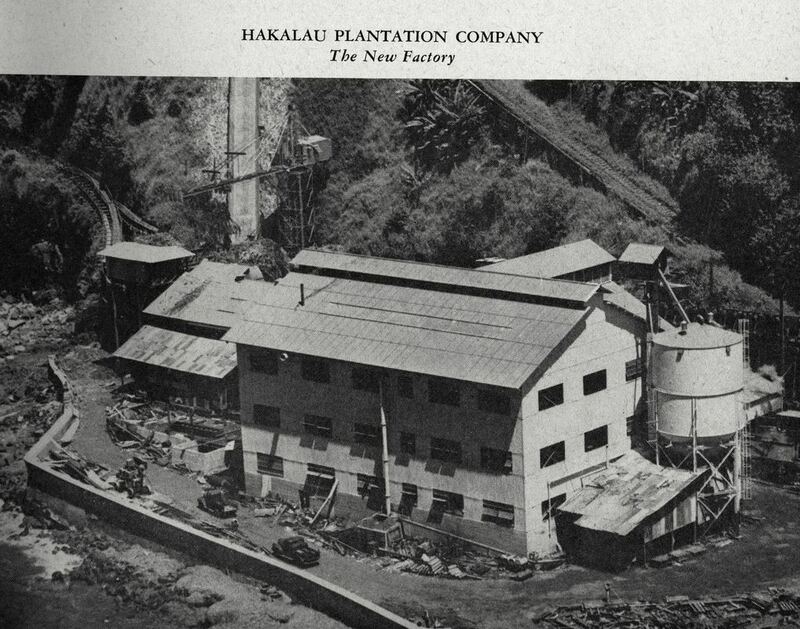 The new Hakalau Mill complex finished in 1947. 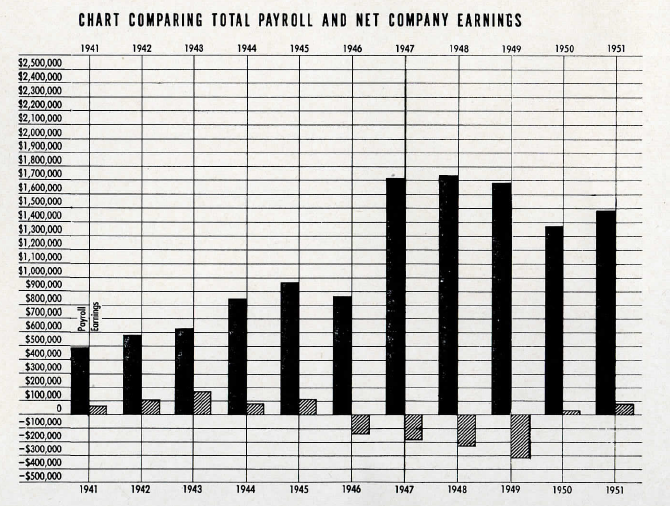 C. Brewer Annual Report 1947, courtesy of John Cross, Custodian of the Records, the Olson Trust Sugar Plantation Archives. Excerpt's from Hakalau Plantation's 1947 Annual Report, ​courtesy of John Cross, Custodian of the Records, the Olson Trust Sugar Plantation Archives. Hilo Tribune Herald Article, April 2, 1946, "Hakalau Damage Over $500,000"
Hilo Tribune Herald, April, 1946, "Official Big Island Tidal Wave Death List Released by Board of Health"